There is no place where the Holy Week in Spain is not lived with passion. If there is a place in the world where the Holy Week in Spain is celebrated with special emotion, this is certainly the city on the banks of the Guadalquivir River. Emotions and feelings that arise during its famous madrugá on the night from Thursday to Friday. In this procession, apart from the smell of orange blossoms that decorate the images, you can enjoy the image of Our Lady of Conception, carried by the Brotherhood of Silence, which, by the way, is the oldest one, dating from 1340. 3,200 members of the Nazarene Brotherhood accompany the sculpture of Our Lady of Hope of Macarena, whose decorating emeralds were donated by the bullfighter Jose Gallo. Don’t miss Esperanza de Triana, the patron saint of sailors, who is perfectly recognizable by carring a life preserver in her hands. El Gran Poder, the culmination work of Seville Baroque artists, seems to walk the streets on its own, due to the particular movements of the image bearers. Los Gitanos is closely linked to the House of Alba, and El Calvario is the one with the shortest route, but the one that carries most candles and it’s just spectacular. 6 brotherhoods, 12 images, 12 hours of processions, 11,000 participants, more than half a million people on the street, music, tears… can you ask for more thrills on a single night? The kind of passion and emotions that you can feel every Holy Thursday in the port of Malaga is a bit different. The Spanish Legion members arrive here by ship from Melilla, with their cornets and their unalterable march of 180 steps per minute. And they do so in order to participate in the transfer of the Holy Christ of the Good Death and Spirits to his processional throne in the church of Santo Domingo, making a tour across the main streets of the city that starts at the very dock where they disembark. Exactly here, while enjoying the Mediterranean breeze, you can experience one of the most exciting moments of the Holy week in Spain. The 200 legionnaires who are part of the parade rise the sculpture with one hand as they begin to sing “I’m a man who was struck by luck with fierce paw; I’m a groom of Death that will join in strong bond with such a loyal companion.” The singing will be heard during the whole procession, which is held at around eight in the evening. They sing this song uninterruptedly, again and again, for more than five hours of parade. Another impressive Holy Week ceremony, although it is not with a procession, is the Empalados of Valverde de la Vera (Caceres) cross their small town of less than 600 inhabitants in absolute silence -only broken by the sound of iron- with a little bit unconventional outfit. 80 meters of rope firmly tied to their torsos and their arms so that they can hold two crossed swords on their backs. In addition, they parade barefoot and, to respect the tradition, wearing a crown of thorns, a veil that covers the face, and a woman’s petticoat. They wander through the streets next to a big candle that throws some light on them. They are not allowed to speak, and every time that they see a cross during their tour they will have to genuflect. This particular ordeal for them usually lasts an hour. It has nothing to do with the Procesion de los Gitanos in Granada. Here, the passion and sadness of the traditional music becomes more intense in the light of the fires that are lit at the gates of the caves while the image is ascending the hills of Sacromonte. It is very impressive as it passes through the Paseo de los Tristes, under the beauty of an incredibly illuminated Alhambra. However, let’s not forget that the Holy Week in Spain is a very vibrant event in all cities. 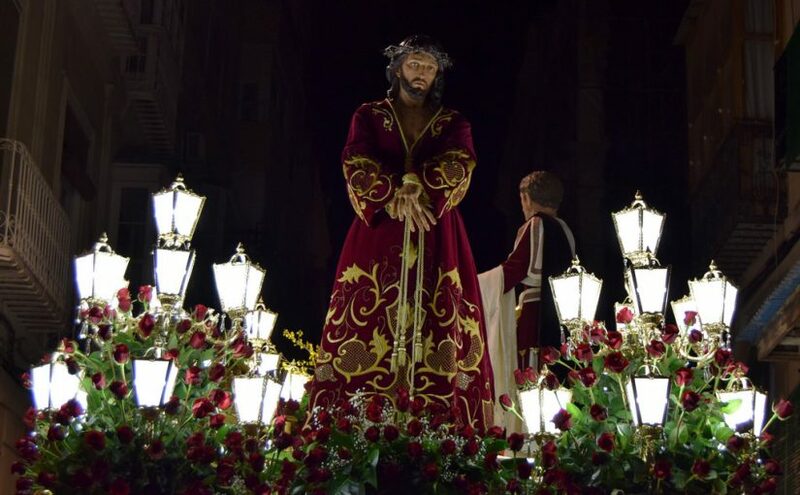 From the living Passion of Castro Urdiales in which the last supper, crucifixion, death and resurrection are reenact, to the procession of Cristo del Socorro in Cartagena, characterized by the sobriety and introspective character of the celebration. Nor should we forget the Holy Week ritual that attract thousands of Madrid people every year, who want to see the Christ of Medinaceli with candles in their hands and chains on their feet. The Christ is carried by the Primary Confraternity of the Royal and Illustrious Slavery of Our Father Jesus Nazarene; to avoid being seduced by the woman devil of Orihuela, who is depicted naked with an apple in her hand that symbolizes sin. In Cuenca, for example, the most impressive thing is hearing the roar of the crowds in the Stations of the Cross procession. By the way, if there is a characteristic sound of the Holy Week, that is the Calanda drums. Are you going to miss the Holy Week in Spain? Feel the passion! 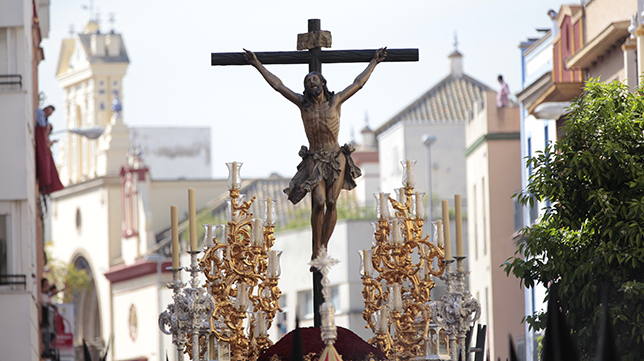 Go and experience the Holy Week in Spain. . If there is a word you could define this time of the year with, it would be, without doubt, emotions.